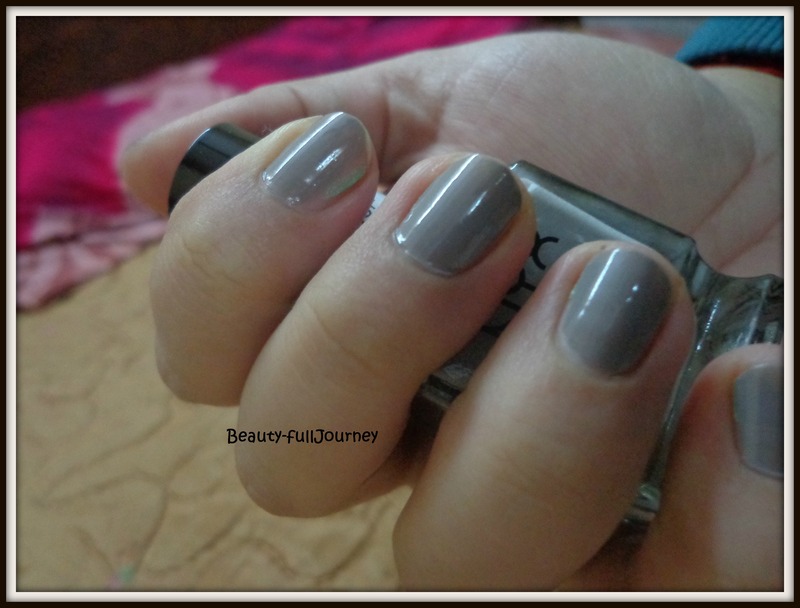 REVIEW, NOTD: NYX Advanced Salon Formula Nail Polish – Cloudy. 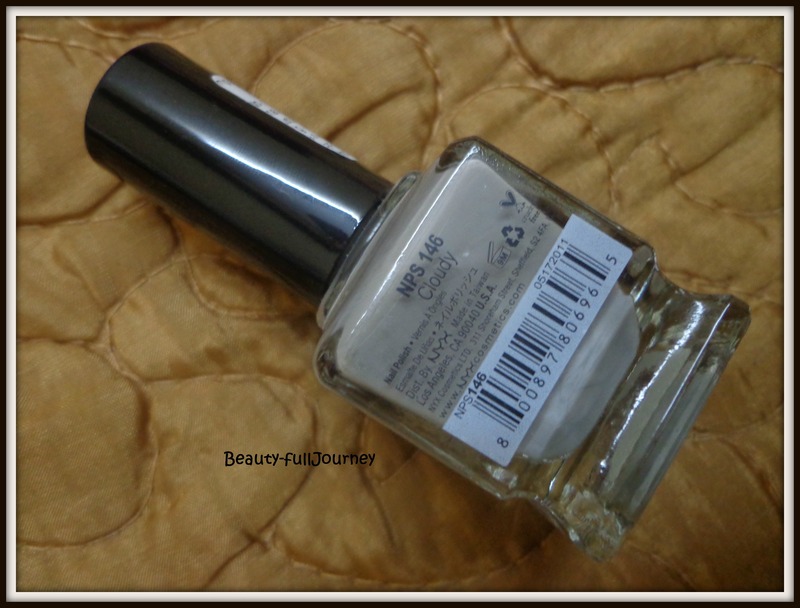 NYX Advanced Salon Formula Nail polish. NYX Cosmetics introduces a professional nail care collection that will adorn your fingers and toes – the Salon Formula Nail Polish! These exceptional nail polishes come in 144 brilliant on-trend colors including 10 nail treatments that will make it seem like you just received a fresh manicure and pedicure from a professional salon! See the vividness of each color with one easy coat on your nails. Just one coat, it’s that quick and easy! With the long-lasting formula and an extraordinary selection of colors to fit your every mood and pretty outfits, your nails will be dazzling all the time! 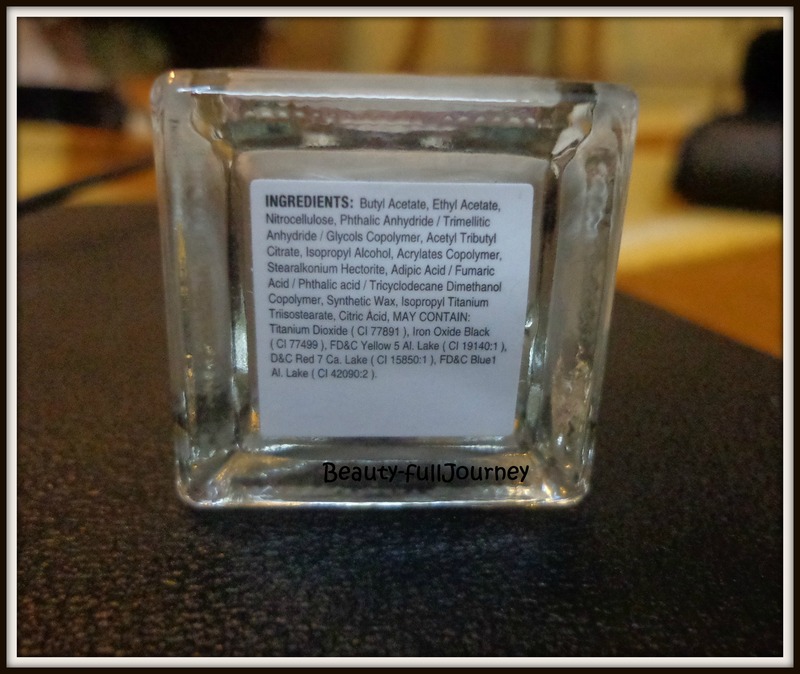 Price: $4 and in India INR 350 for 15ml. But it is available with discounts on most online shopping stores. Available at cherryculture, medplusbeauty, flipkart. 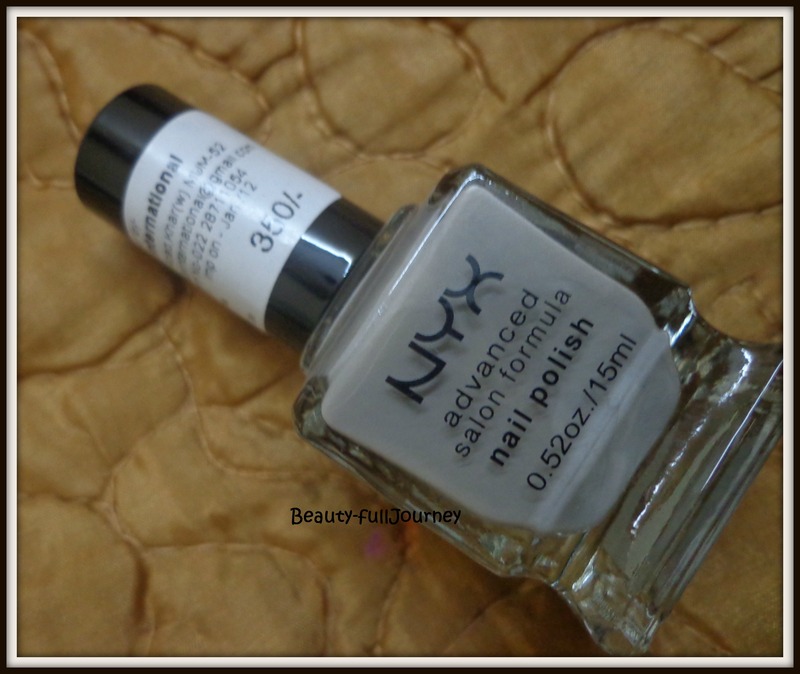 I don’t know why, but a lot of us Indian beauty addicts have some fascination with NYX, atleast I surely do! 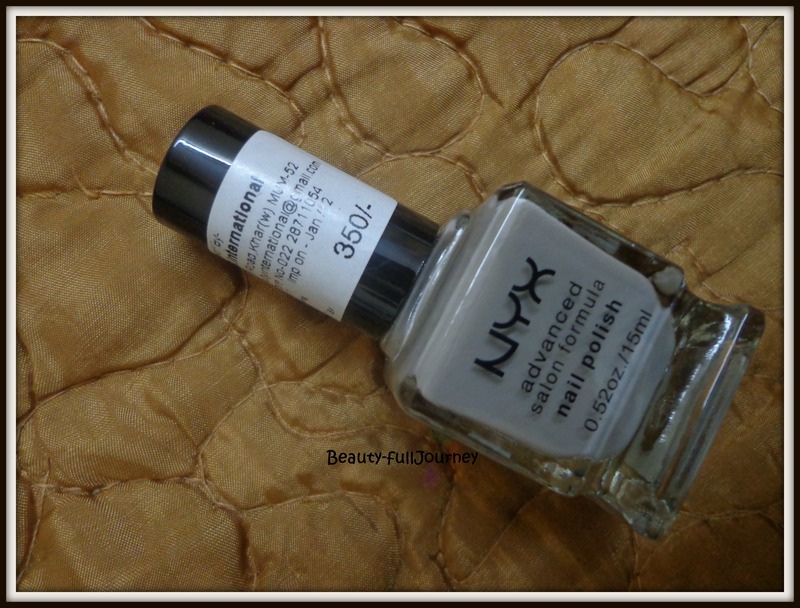 I have previously tried two NYX nail paints. I wasn’t very impressed with them. I generally feel that our own Colorbar nail paints are much better than all other brands. 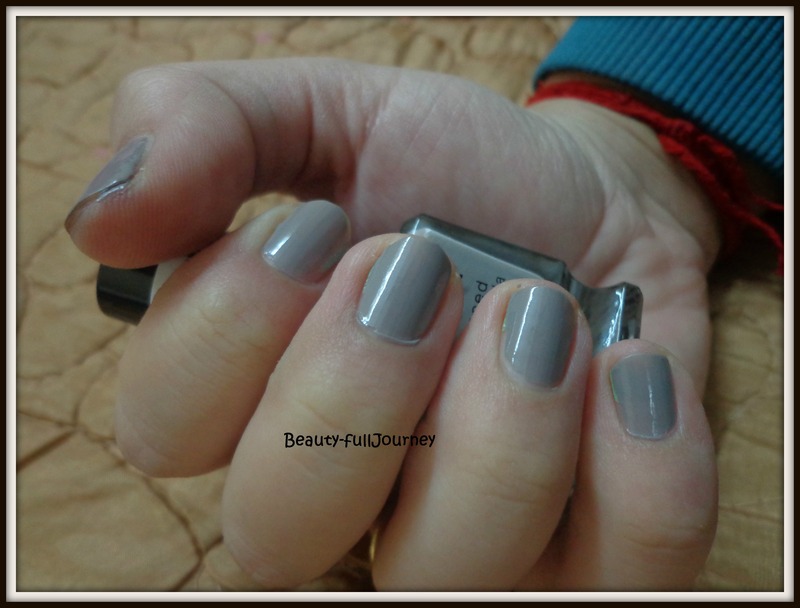 When I decided to try out these Advanced Salon Formula nail paints (phew! Such a long name.. I’ll just call them ASF from now on), I searched the net for swatches and I was just blown away by the whole range. They have such gorgeous shades, especially the glitter ones! I am happy Colorbar has come up with glitter nail paints because otherwise we have such a dearth of them in India. For those who want to try glitter nail paints at a decent price, do check out NYX’s ASF range. You can google the swatches. This range also has a dupe for Deborah Lippmann’s “Happy Birthday” called “Multi Glitter”. These nail paints have also won Temptalia’s Editor Choice awards. Well, I had quite a tough time deciding which ones I should try first. The total range has 100+ shades, Medplusbeauty doesn’t have them all but has quite a lot of them in stock. I bought them for INR297 from medplusbeauty. You can also find them at Flipkart for less price, but only 5-6 shades are available there. I don’t remember seeing them at Sephora when I visited it but they should be available there. I’m talking about Cloudy today. The nail paints come in a square shaped sturdy glass bottle. The consistency of the nail paint is very good. It is just perfect, not at all runny. It comes quite opaque on 1 coat. I applied 2 coats here to get a good finish. It dried quite fast, I hate nail paints that take ages to dry. It gave a glossy finish which stayed for 4-5 days easily, with minimal chipping. Cloudy is a very nice gray shade. It is described by NYX as dirty white. Then I think, it’s a very dirty white 😛 A perfect winter shade for me. This shade is also very apt for formal occasions. Since these aren’t easily available in Indian stores, you can only purchase them online, and that way shade selection is tough. So googling swatches before buying is a must. It contains 15ml of nail paint, quite a good amount for the price I feel. At first I didn’t want to spend almost 300 bucks on a nail paint because I change my nail paints very often but personally, I found these quite reasonable if you see the quantity and quality. Other brands like Colorbar, Maybelline Colorama, Revlon give 8-9ml in a price range of Rs.100-150 so this quantity,15ml is almost double and the quality and colour range is quite superior to those. Also, the recent ranges of Colorbar have been priced in the range of 300-500 so these are just fine! 2) Lots of glitter variants available. 5) Sturdy and attractive packaging. Next > REVIEW, SWATCHES: Garnier BB cream.